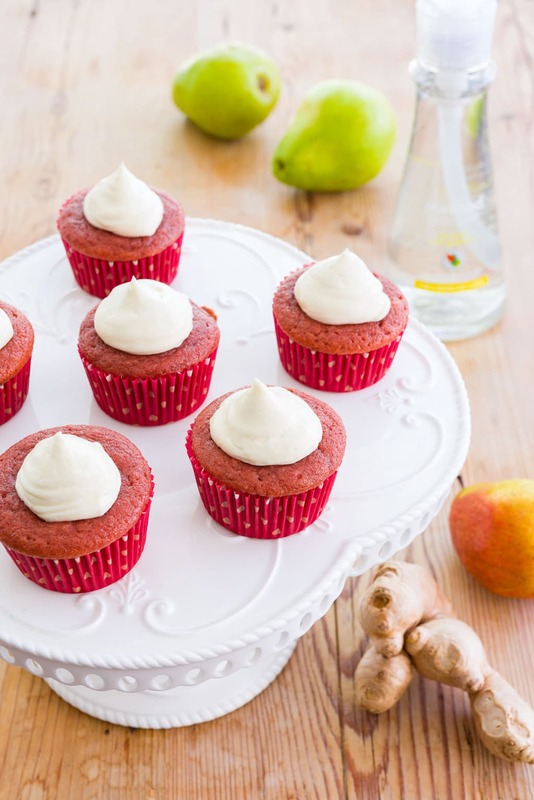 Using beets to color these red velvet cupcakes not only imparts a stunning hue, they also add natural sweetness, while giving the cupcakes a tender crumb. 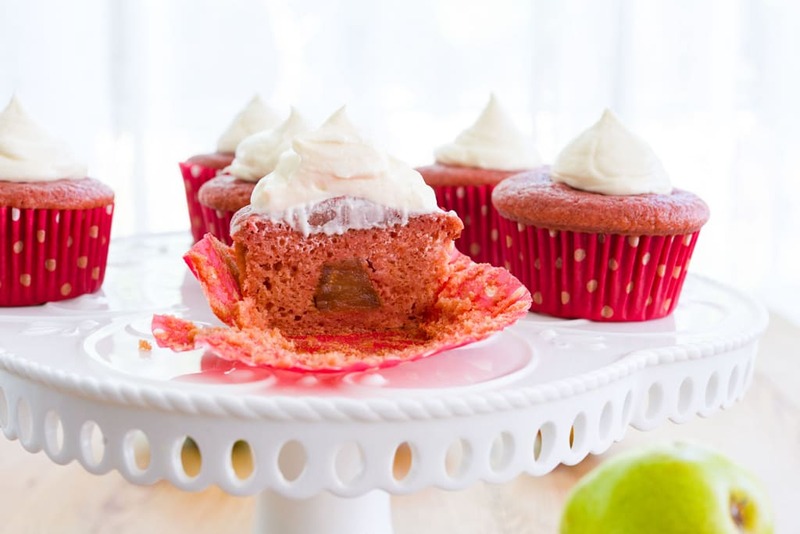 With a piece of caramel poached pear in the center and frosted with a ginger white chocolate buttercream, these aren't your average red velvet cupcakes. When our friends at method offered to sponsor a post on No Recipes I was thrilled because I love their products. 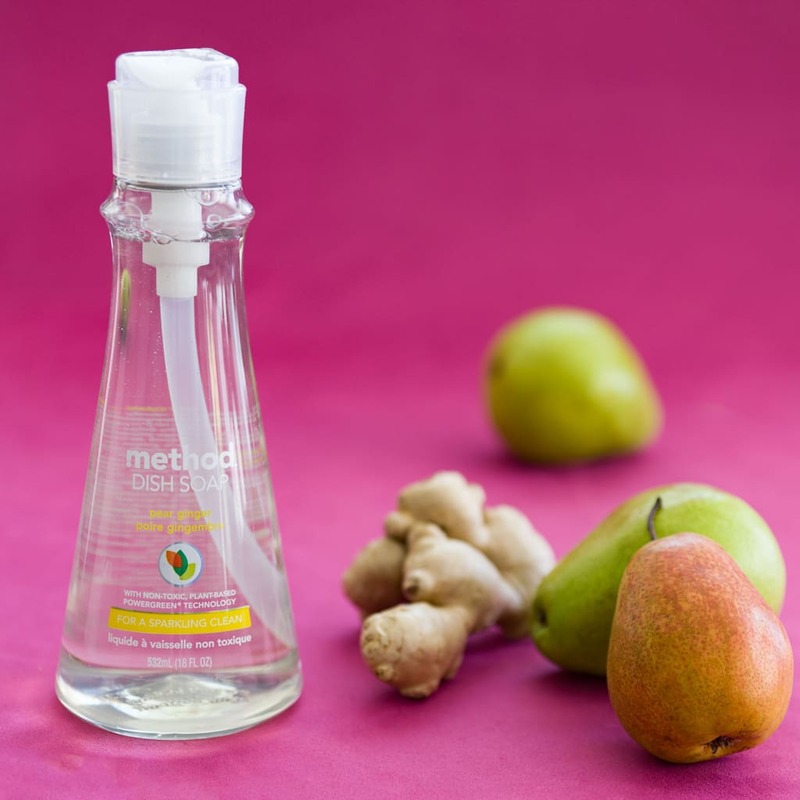 I mean love, as in I’m sitting here sniffing an open bottle of pear ginger dish soap as I type this… Love, as in I pack method products in my suitcase to bring home to Japan every time I’m in the US (method peeps, your products will sell in Japan…. call me). The customs people in Japan are always surprised when they open up my suitcase expecting to find booze, and discover my stash of cleaning products instead. With a wide pump nozzle that doesn’t clog, and broad base that keeps the bottle from falling into the sink, the dish soap is easy to use and looks great on the counter. It also actually smells like the advertised ingredients! But perhaps the thing I love the most about method’s dish soap, is its magical ability to be tough on grease while being easy on my hands. 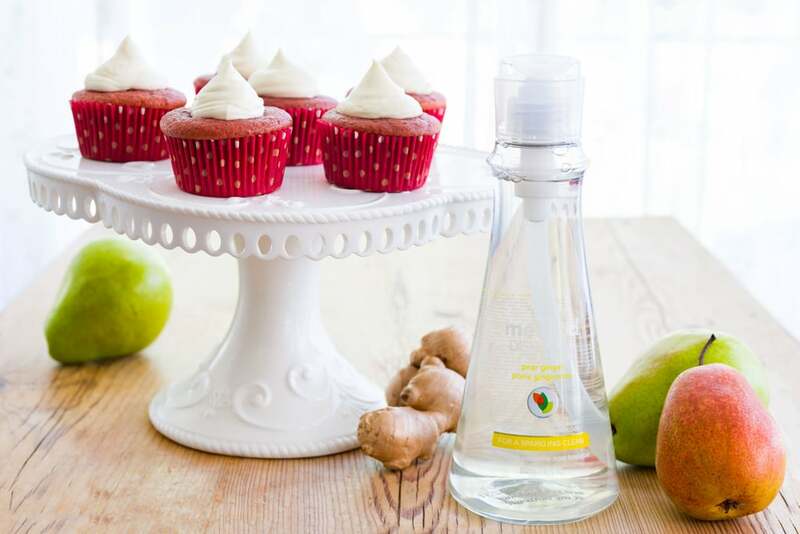 It may sound odd to call a dish soap delicious, but that’s how this pear ginger smells, and it’s what inspired me to make these edibly delicious red velvet cupcakes with caramelized pear and a ginger cream cheese frosting. I used beets in the cupcakes for the color (vinegar reacts with the pigments in beets and turns them bright red), but they also add some sweetness (reducing the need for sugar), and moisture, which allowed me to cut back on the butter in the cupcakes without making them dry. To make the cube of caramel poached pear in the center, I first made a dark caramel, which was then dissolved with some chardonnay. Then, I poached some firm Anjou pears in the liquid, until they were tender. For the ginger I decided to integrate it into the frosting, using a base of cream cheese and butter with some melted white chocolate whipped in. If it sounds rich, it is, but it has a lot less sugar than most frostings, which lets you put a lot more onto each cupcake without making it cloyingly sweet. The ginger also helps balance out the richness, imparting it’s wonderful fragrance with just a hint of heat to cut through the fat. If this sounds like an epic baking project, it was, which made it perfect for the cue I was given by method: to Fear No Mess. I guess the marketing gods must have been smiling down on my kitchen, because the day before I’d planned to start testing this recipe, my dishwasher decided to head to the big kitchen appliance retirement home in the sky. 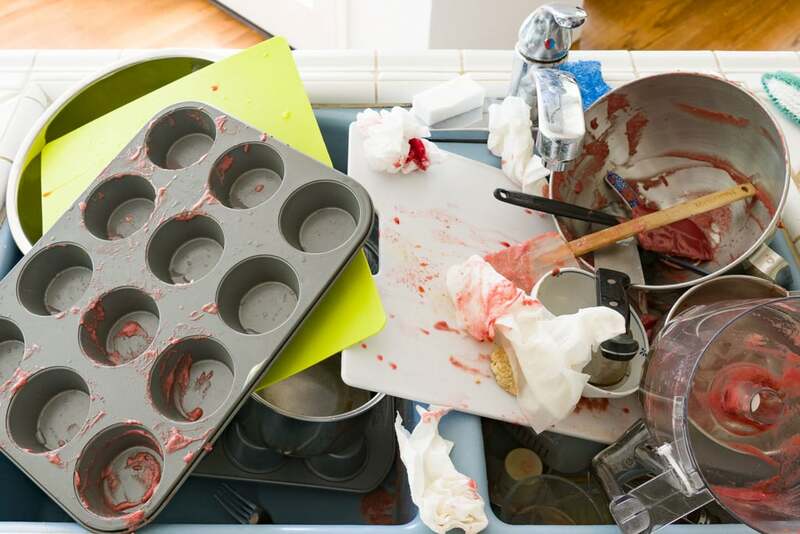 The untimely demise of the dishwasher left me with nothing but my hands, water and a bottle of method to tackle the copious bowls, pots, pans, spoons, spatulas, whisks, mixer bowls and food processor parts that I’d used to make these cupcakes. But that wasn’t the worst of it. 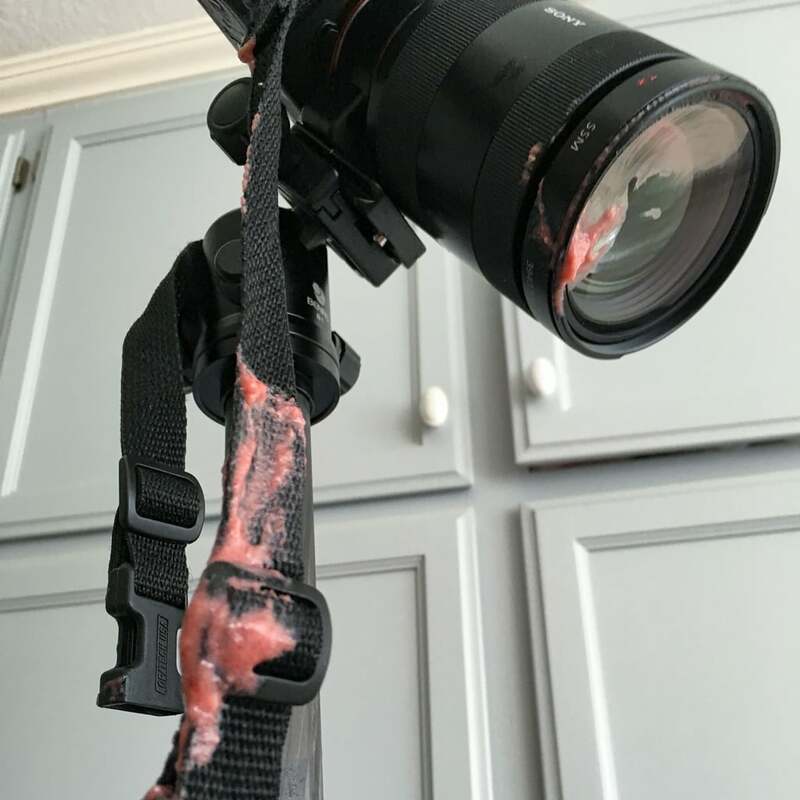 While shooting process shots, I tripped over my tripod, sending my camera lens-first into a tray of cupcakes that were just about to go into the oven. With the remains of my fuschia cupcake batter splattered all over the kitchen, I started over, adding to the mess. But don’t let the effort or my crazy pile of stuff in the sink scare you, these cupcakes are SCRUMPTIOUS and were absolutely worth the cleanup, so fear no mess and go make a batch of these these red velvet cupcakes today! Peel the pears and then slice them into 3 slices lengthwise. Cut the core out of the pears and then cut the rest of the pear into 12 1/2-inch cubes. Add the water to a heavy bottomed sauce pan and then mound 1/2 cup of granulated sugar in the middle. Do not stir the mixture. Cover the pot with a lid and bring the sugar mixture to a boil over medium-high heat. Remove the lid and continue boiling the mixture until it reaches 345 degrees F. It should be a dark brown. Turn off the heat and slowly pour in the chardonnay, it will bubble and spatter so be very careful. Return the pot to medium heat and cook the mixture until any solids dissolve. Add the cubed pear and poach until the pears are tender (about 5 minutes). Ideally you'll want to let the pears soak in the caramel mixture overnight. 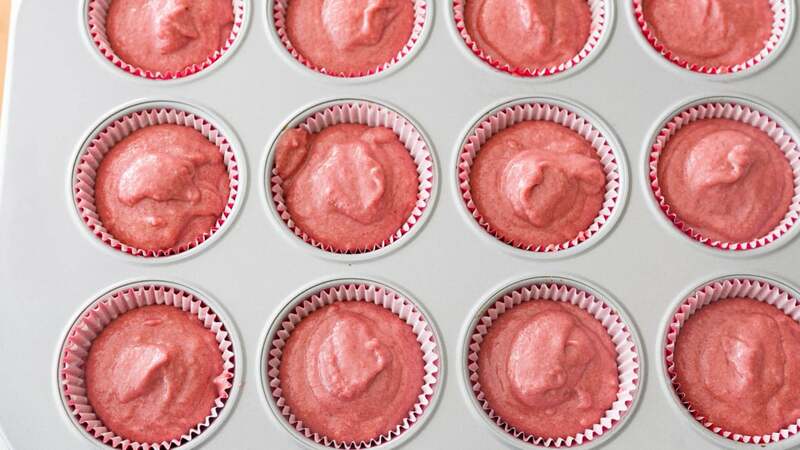 To make the red velvet cupcakes, line a muffin pan with your favorite liners and preheat the oven to 350 degrees F.
Put the roasted beets, and vinegar in food processor and process until the beets firm a smooth purée. Add the buttermilk, eggs, and vanilla and process until smooth. 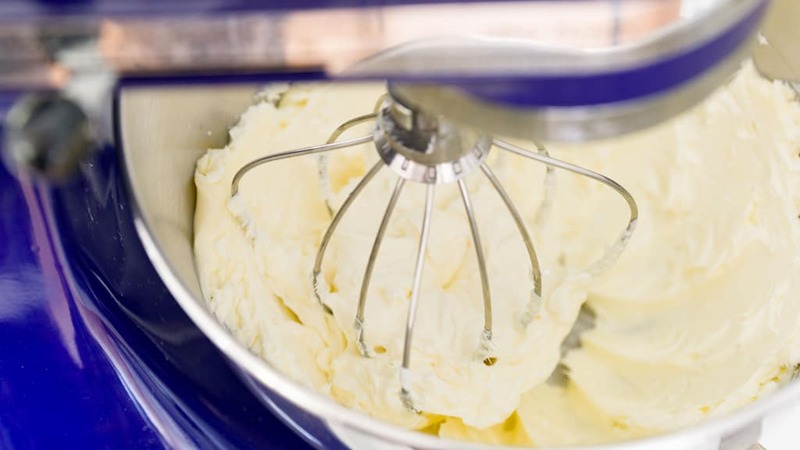 In the bowl of an electric mixer, whisk together the cake flour, sugar, baking powder, baking soda and kosher salt. 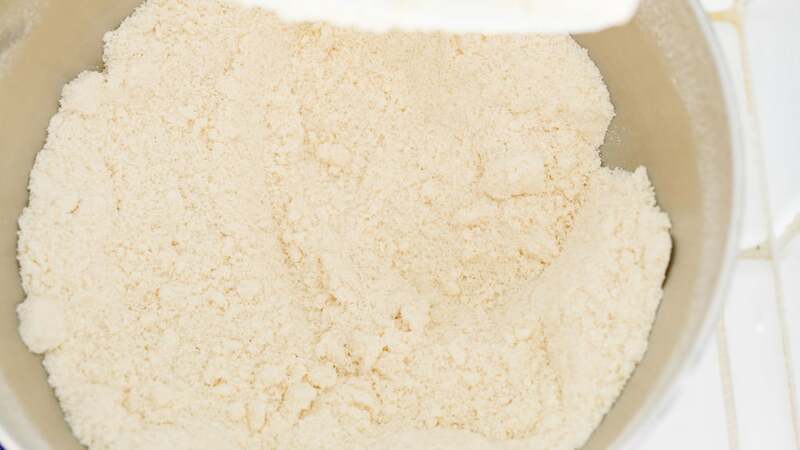 Fit the paddle attachment to the mixer and add the room temperature butter to the flour mixture, beating until the mixture is evenly combined. 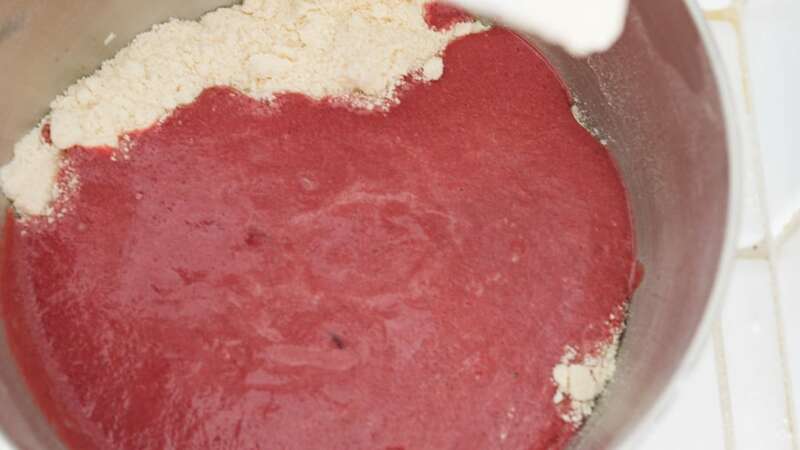 Pour the pureed beet mixture into the flour and butter mixture and beat over medium-low speed until just combined and free of lumps. 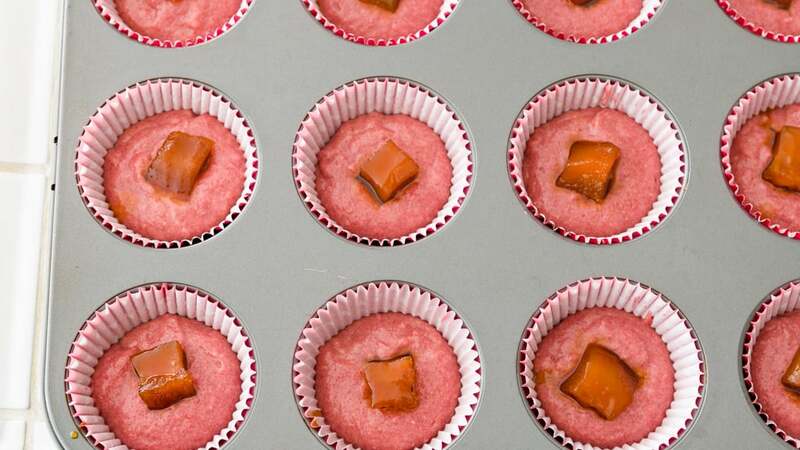 Fill the cupcake cups 1/3 of the way full with the red velvet batter, and then drop a cube of caramel poached pear in the center of each cup. Cover with the remaining red velvet batter. Put the pan in the oven and bake until a toothpick inserted into the center of a cupcake comes out clean (about 20 minutes). Let the cupcakes cool completely on a wire rack. 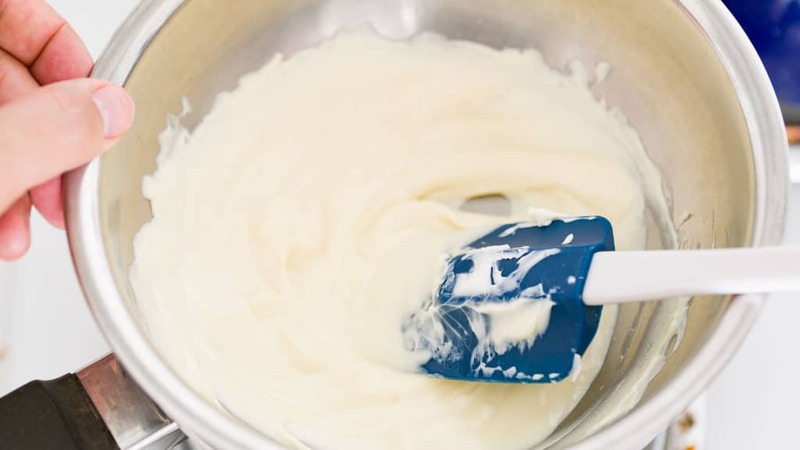 To make the frosting, fill a pot partially with water and find a bowl that rests comfortably on the lip of the pot. Bring the water to a boil and then lower the heat to maintain a gentle simmer. Add the chopped white chocolate to the bowl and then stir constantly with a spatula until the chocolate is almost completely melted. Remove the bowl for the pot and continue to stir until the chocolate is fully melted. Let this cool slightly while you prepare the rest of the frosting. 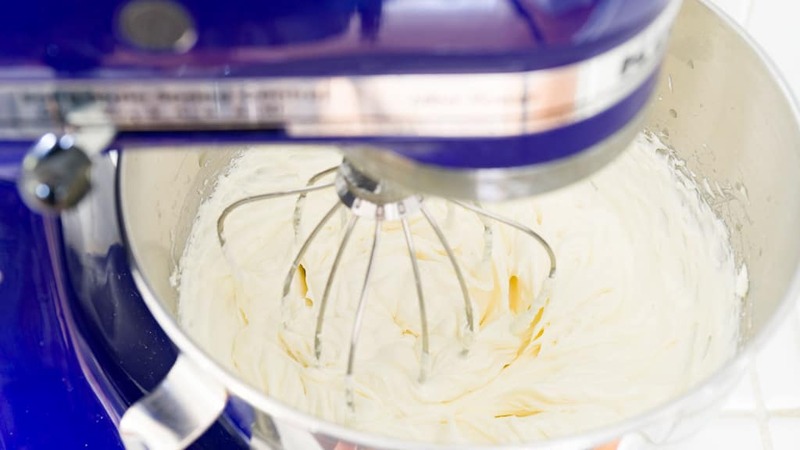 In a mixer fitted with the whisk attachment, beat the cream cheese and butter together on medium speed until smooth. 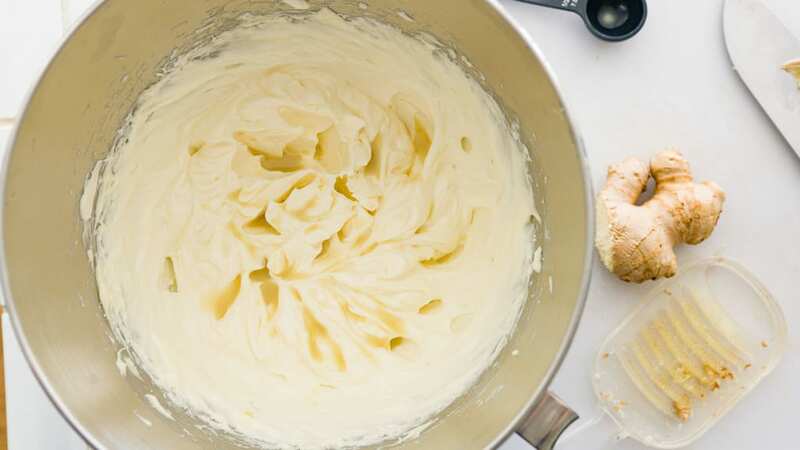 Add the melted white chocolate and continue mixing until combined. Lower the speed and whisk in the powdered sugar and ginger juice until incorporated. Turn up the speed and whisk until light and fluffy. When the red velvet cupcakes are cool, you can either spread the frosting on top of the cupcakes using a knife, or you can fill a piping bag with your favorite pastry tip and decorate them. If you don't have a pastry bag, you can put the frosting into a plastic freezer bag and cut the corner off, piping little kisses of frosting onto the center of each cupcake. *NOTE: The measurement for beets is after they’ve been roasted and peeled (they’re sold roasted in many grocery stores). If you are roasting them yourself you’ll need about 450 grams of beets. P.S. This post was sponsored by our friends at method, but as always, the opinions expressed are my own. I would love to know where this cake plate comes from! Hi Charlie, the cake stand is from Lenox. Oh my, these look lovely!